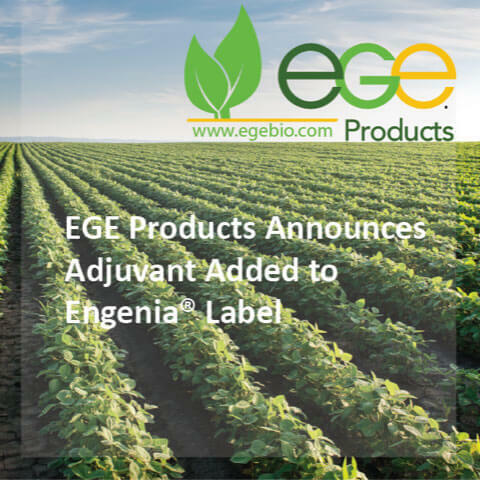 Minneola, KS— 1/28/19 — EGE Products is excited to announce that one of its products, in their line of industry leading agricultural products, has gained label approval with BASF’s Engenia® herbicide. “Condense+DRA is a non-AMS water conditioner, surfactant, and drift retardant.” It works well with a wide range of tank mixes, allowing for efficiency for farmers when labels call for water conditioners or spreader-wetter adjuvants. EGE products also on label with Engenia® include: Padlock DRA®, Padlock®, Absorb 100®, Length EXT, Padlock®, Rivet 90™, Shackle™, & Shackle EXT™. EGE’s products do not contribute to drift issues, which is one of the biggest hurdles for farmers. Other products, not on label yet, include Absil, Corporal HSOC, Padlock PLUS, and ShackLock. The premium performance gives peace of mind and frees farmers to use the chemicals that will work best for them with a higher percentage of the costly application staying on target. Founded in 2007, EGE Products is a family-owned agricultural business, with manufacturing in Kansas, and distribution across the nation. To ensure quality and value, we test the products on our own farm land and crops. The quality spray adjuvants are made for farmers, by farmers. EGE Productsare either registered trademarks or trademarks of EGE Products in the United States and/or other countries.